The Alcatel One Touch Scribe HD feels like a device which is only halfway to becoming a decent smartphone. The lack of internal storage, disappointing video playback and unnecessary stylus just screams of a product which was rushed out to cash in on the big-phone revolution sweeping the industry. What's the smartphone world missing? Yep that's right, more handsets which come with a stylus – luckily the Alcatel One Touch Scribe HD is here to save the day. Ok so maybe that's not what it's missing, but Alcatel has launched this 5-inch smartphone anyway as it looks to take on the S-Pen wielding Samsung Galaxy Note 2 as well as handsets such as the Sony Xperia Z and ZTE Grand S.
Sporting a 1.2GHz quad-core processor, 1GB of RAM, 5-inch IPS HD display and running Android Jelly Bean the One Touch Scribe HD certainly has the vital statistics of a high end mobile device. Apparently the One Touch Scribe HD has been designed in such a way that its quad-core chip won't suffer from overheating, an issue Alcatel claims affects some of its rivals – zing! Expected to launch globally the exact Alcatel One Touch Scribe HD release date and price is yet to be announced, with no guarantees on which countries will be treated to it. The One Touch Scribe HD is clad in glossy plastic which doesn't really exude high-end, but the handset feels solid enough and at just 8.5mm thick it isn't overly cumbersome either. We were easily able to wrap our paw round the One Touch Scribe HD and hit the volume rocker on the right and power/lock key on top without issue, while our thumb happily danced over the bright, crisp AMOLED display. You can't get into the Scribe HD's chassis, meaning there's no access to the reasonably sized 2,500mAh battery and to reflect this there is a covered port on either side of the phone. On the right, just below the volume switch is the microSD slot, while on the left is a port for your microSIM. There's a groove above each of the plastic dust covers, making it easy to open them up and slide in a card. You'll definitely be thankful for the microSD card option on the Scribe HD as for some reason Alcatel has only put 4GB of internal storage into the handset, with just 2GB actually available for use. This shockingly low amount of storage on a handset clearly designed to consume media on is completely baffling and a poor choice by Alcatel in our eyes. There are no touch buttons present below the 5-inch display with Alcatel opting to have the Android navigation keys on screen – just like Google would have wanted. The screen was responsive to our various pokes and prods which meant we were easily able to navigate around the Jelly Bean interface. 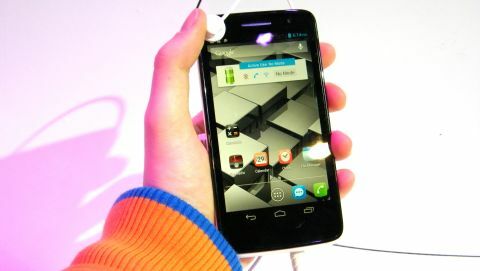 As with its other handsets launched at CES 2013, the One Touch Idol and Idol Ultra, Alcatel has applied a simply design overlay on the Android system, changing the style of the icons and adding a couple of additional apps such as a compass and torch. We were able to breeze through the homescreens and apps without any hint of slow down, probably thanks in part to the quad-core chip house inside the One Touch Scribe HD. With such a large screen the One Touch Scribe HD should be a joy for anyone who likes to watch video on the go, or at least that's what we hoped. The reality was that video playback on the Scribe HD is a bit of a letdown as the clip we watched lacked the definition and sharp lines we've witnessed on other devices. Alcatel has taken the liberty of fiddling with the Android camera application, giving you a new layout which we found pretty easy to use, although the video and shutter buttons were a bit too close together for our liking. The 8MP camera on the back of the One Touch Scribe HD provides relatively decent images and there's a single LED flash to help with low light situations. If you fancy a quick vanity shot or a video chat Alcatel has equipped the Scribe HD with a front-facing 1.3MP snapper which like the rear cam can shoot 720p video. It's not just the handset you get when you buy the Alcatel One Touch HD though, you're also furnished with a stylus. We'll tell you where we stand with the stylus from the off, it's ugly, too big and basically pointless. You'll notice it looks just like a pen and that's because it is… Yep twist the pointy end of this metallic stick and the nib will poke its head out of the end. This gives you the first clue that the stylus isn't much cop, making it clear to the user you're far better of writing on a piece of paper than trying anything fancy on the One Touch Scribe HD. At the other end of the stylus pen is the main attraction – a large rubber dome which is almost the same size as your finger. This means it doesn't provide you with any greater accuracy on screen and thanks to its enormous size it can't be hidden away in the handset like the S-Pen on the Galaxy Note 2. Adding insult to injury there doesn't seem to be any dedicated apps on the One Touch Scribe HD which utilise a stylus. We did asked about dedicated applications and according to the representatives on the booth the Scribe HD should come with a drawing app, although we found no evidence of this on the two handsets we played with. The Alcatel One Touch Scribe HD feels like a device which is only halfway to becoming a decent smartphone. The lack of internal storage, disappointing video playback and unnecessary stylus just screams of a product which was rushed out to cash in on the big-phone revolution which seems to be sweeping the industry. We can't see the Scribe HD gaining any meaningful traction in the major global markets and you'd be best advised to spend your money elsewhere.